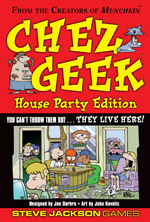 Fans of Chez Geek will have noticed the new version now shipping: Chez Geek House Party Edition. The question on everyone's mind is "What's different?" First, the box is bigger. In fact, the packaging dimensions are identical to the standard Munchkin boxes. This change was partially to accomodate the extra components (more on that in a second) and partially in response to retailers -- their shelves are nicely set up for Munchkin (no surprise, given how many they sell!) so they wanted the Chez games to fit better. Inside the box, the components . . . well, there are more of them. The original cards remain, but we added all the cards from Slack Attack and Block Party. On top of that, we threw in Slack tokens, very similar to those you saw in the newest edition of Chez Goth. So: more of the stuff you like without sacrificing any of the original Slack . . . er, goodness.